First Grader, Courtnie B. from the Fairmont Mable Campus took 1st Place in the Water is Life Poster Contest for this adorable piece. She will receive her award at the Angel's Game on May 16. On May 16 at Angel Stadium of Anaheim we will celebrate the winners of the Water is Life poster contest. 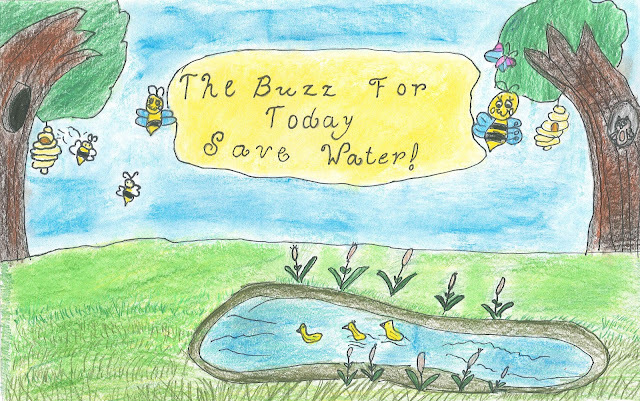 Each year Anaheim Public Utilities hosts the annual water conservation poster contest as part of the celebration of May as Water Awareness Month in California. First through sixth graders are invited to participate in this contest. Three winners are selected from each grade. Winning posters are displayed in the lobby of Anaheim West Tower and trophies are presented at a ceremony prior to an Anaheim Angels baseball game. First place winners also receive a $100 savings bond. Students and their families will be treated to an Angel's game where they will receive a special trophy, hat and the chance to be on the field before the game starts. Courtnie B. - 1st Grade, 1st place winner. She will also receive a $100.00 savings bond. Color It Orange is an annual art invitational for OC public and private schools. Six students from each school are invited to submit artwork for the exhibit. The following students have work in the Laguna Festival of Art Junior Exhibition which will be held in July and August in Laguna Beach. Their work will also be recognized in the Imagination Celebration 1,000 Pieces of Art Exhibition which will be on display in the South Coast Plaza Crate and Barrel Wing from May 16th to May 30th and then at the Laguna Festival in July and August. The student’s work was selected by a panel of judges from hundreds of pieces submitted by both public and private schools in Orange County. Congratulations go out to Fairmont Mable Campus students Yiyi O. and Tiffany K. for winning first place in the Council on Aging Orange County's (COAOC) yearly art contest. Yiyi won in the 1st through 3rd grade category and Tiffany won in the 4th through 6th grade category. The theme of this year's contest was "Celebrate Successful Aging." Yiyi's and Tiffany's artwork will hang in the COAOC offices in Tustin for the next year, and the students will be recognized at the 7th Annual Council on Aging Orange County Luncheon held at the Irvine Marriott on May 4.